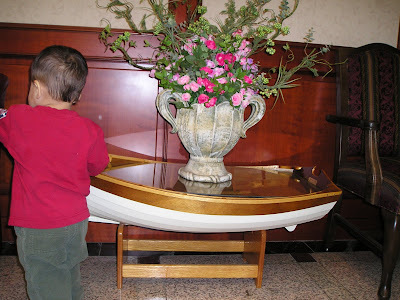 I would like to have a boat coffee table like the one in the picture. It would be a great remembrance of my time spent here in the land of the morning calm. I plan to decorate our family room with a nautical theme and I think this is where I will start. I found plans on the internet to build your own but none were quite as appealing as this one. Hopefully it was purchased here in Korea and I will be able to find one before I transfer back to the U.S.
What a cute table. Happy WW! I hope you can buy your own sailor's coffee table which you can bring along to America. I am just wondering, is there no sailor's coffee table in America so that you can save in the delivery cost? Thanks for the post. God bless you always. Very nice Joops! cutie table.. it suits to a sailor man.. cool! What a great idea Sir John, thats a good remembrance.